[New for 2012] Usually I regret trying to buy ice cream from Stop & Shop because of their lackluster selection, but boy oh boy am I glad I stopped there today. The dead of winter is a lousy time to try and find new products, but what do I see before me but Ben & Jerry's first limited edition flavor of 2012! I don't want to keep you in suspense too long, so here it is. Rocky Road-ish. Oh -ish, how I have abused your vague ways over the years. That and the word thingy, as in "plug the thingy into that rectangle-ish looking hole". Man I love being vague... vague and sarcastic.. ahhh, wait, sorry, ice cream. So there I was, ready to grab a pint of Talenti when I saw this bad boy on the bottom shelf. Don't ask me what made me check, but I instantly noticed this pint out of place. I thought it was S'mores at first. I read the description. Toasted Marshmallow Ice Cream with a Toasted Marshmallow Swirl & Fudge Covered Almonds. Toasted Marshmallow ice cream? Are you serious? You expect me NOT to buy this? It could have cost $10 and I would have bought it, I don't care, I want it! I want it now!! I race to the car and pop open the lid. That crater is where an almond use to be (it stuck to the lid and begged me to put him out of his misery). The swirl definitely looks kinda... ummm, funky, shall we say. It's slightly darker and has gritty (yet mushy) look to it. I can't wait any longer! I dive in! Oh the scoopage! and.... wow, that is weird, it's like Rocky Road without the chocolate. Envision a super well made, squishy, creamy, rocky road, but then somehow extract the chocolate flavor because there is none. Like none-none. Fudge on the almonds you say? Yeah, that's like putting new rims on your 24 year old rust bucket, it doesn't matter. - disclaimer, my car is working it's way up to rust bucket... just teasing car, don't break down on me. I'd call this one weird but that doesn't seem fair, it's too good for that. Immensely different is another choice, but that term still isn't quite right because it's different, yet it really does feel so familiar. Heck, call it bizarro rocky road because it is rocky road, but it isn't. I don't know what they were thinking when they made this, but massive kudos for going far outside the box on this one. Here's one more shot of the very plentiful almonds inside. However, if you really just want to get to the ooey gooey squishy base ice cream, it probably wouldn't be that hard to scoop around them. So, what's my conclusion? Do I sound pretty confused? Well, maybe I am. Overall, I like this ice cream, but at the same time, it's confusing my brain as it searches for a chocolate vibe that isn't there. Unless you don't like almonds, you've got to try at least one pint of this stuff just for the funk factor. A sugary funk factor that is. On Second Scoop: Well well well. I went at this flavor a bit differently today. I attacked a big puddle of swirl (shown above), then ate every almond I could see, and then went back for some more base & swirl. Now I am left with a chilly cold marshmallow aftertaste and possibly a mild sugar overload. The swirl is very gooey, and when eaten by itself and in excess, there is no mistaking that it's (mildly toasted) marshmallow. I know I didn't make it very clear yesterday, but I would love to see this swirl in an actual B&J Rocky Road flavor or even in their S'mores flavor. The base is somewhat mild compared to the swirl, but still fun and worthy to be used somewhere else... Like say with a peanut butter swirl with graham cracker crust chunks, mmmmm, just like peanut butter and fluff on crackers. I can dream, can't I? Oh, and one more thing. While part of me thinks the almonds get in the way, the other part of me realizes that a straight marshmallow on marshmallow flavor might get old quickly without something to break it up. I guess the missing chocolate flavor is why the call it "ish". Still, I had this one on my list to try, but I'm glad you beat me to it. Still on my list, but now not nearly as much of a priority. what about the marshmallow swirl? @Rodzilla: ooey gooey and squishy. at one point I got a spoonful but it's not hugely different from the base (other than consistancy). I'll dig into it more for the second scoop. @LoC: ooooo, there's no limited or seasonal flavors in the UK? that is a bummer!! Thanks. I had a similar thought about Ben and Jerry's Cinnamon Buns - which is so sweet it makes my teeth hurt and doesn't have enough variance to keep the flavor interesting. But I still love it. I'll try this as soon as it arrives in Baltimore. oof... i thought i would LOVE this flavor, being that i love all things marshmallow. however, it was definitely too sweet and "one-note" for me. as someone who usually takes a pass on any kind of ice cream that i think might be too chocolate-ly, i actually think this flavor might have benefited from MORE chocolate. I added coconut to the second half of my pint. It definitely gave the flavour what it was missing. Overall, I liked it, but probably wouldn't buy again. Dubba, I just ate an entire pint of this and STILL don't know what the heck I ate! I totally get what you mean when you say you're at a loss for words to descride this one. 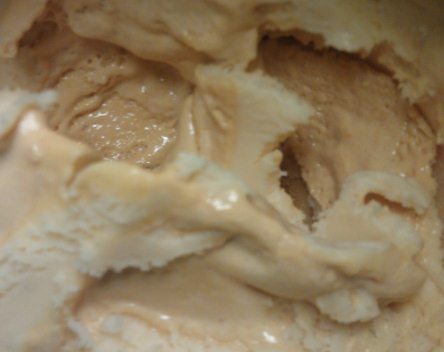 It has a taste and yet doesn't, kinda like a sweet cream ice cream. The chocolate covered almonds definatly save this treat and I don't even like almonds - or do I?!? 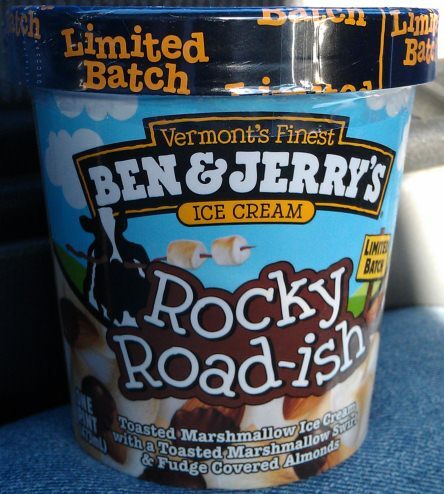 It's definatly a bizarro Rocky Roadish flavor, and yes it went down easy, albeit I probably wouldn't buy it again. I give it a 7/10: Nice try but like Lady Gaga, I just don't get it! Good review! I actually agree with you in that this flavor is strange because neither the marshmallow swirl nor the marshmallow base taste like marshmallow. I was expecting a "marshmallow fluff" flavor, so I was a bit disappointed. I wish it were a little sweeter. The very unique flavor is difficult to describe, as you mentioned, but I kind of like it, too! It sort of grows on you. While I hate nuts in my ice cream, I loved the fudge covered nuts in this flavor because the chocolate and saltiness of the almond enhances the mellow ice cream flavor. 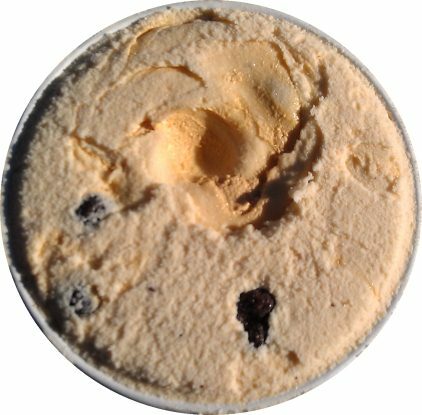 I enjoyed eating this ice cream because just when I thought I was getting only 2 or 3 fudge covered almonds, more and more kept appearing as I kept digging my way through the pint, which was really exciting and fun since I did not expect it. Like you, Dubba, I am still on the fence about trying this again. It was a respectable flavor but there are better flavors out there. I would like to see them use this flavor and swirl again and add fudge covered marshmallow peeps, instead of fudge covered almonds, to get a stronger marshmallow flavor. Knowing B&J, they can find a clever, funny name for it.